Hello all! 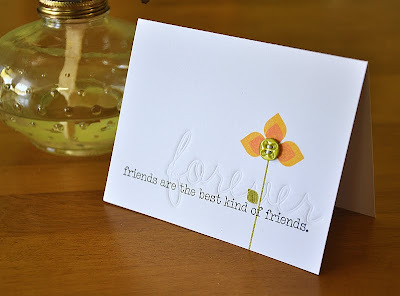 Just popping in quickly to share a simple card with you today, that uses an impressing technique with Papertrey Ink dies. I started today's card by stamping the sentiment, from Wonderful Words Additions, and the flower, from Modern Basics, onto a white card base. 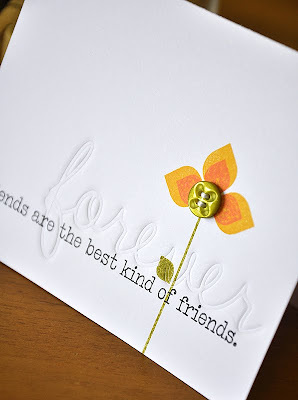 I carefully placed and temporarily attached the "Forever" Wonderful Words Die into place, onto the front of the card base. Then ran it through my die cutting machine, using the proper embossing plate sandwich. 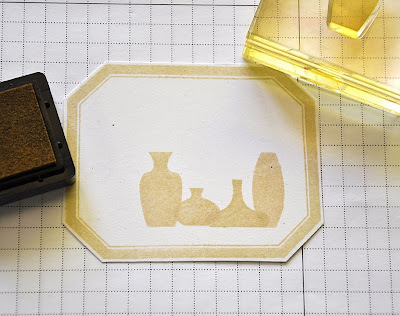 This is pretty much the same technique that Erin Lincoln shared in the Make It Monday #13 video, using only the die instead of both a die and impression plate. 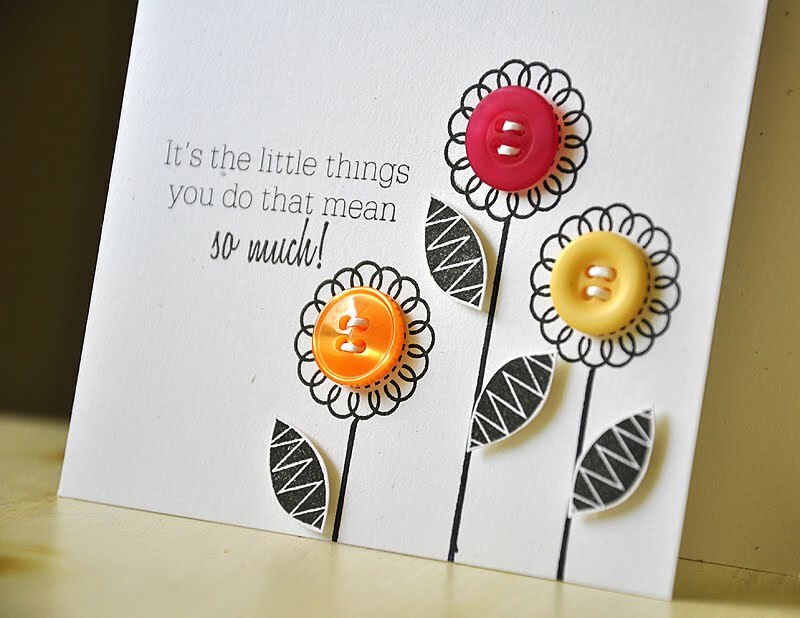 I then finished the card off with a button and white embroidery floss. Easy peasy! Well, that's it from me today. Thanks for stopping by, hope you have a super one! Congrats Ladies! I hope you enjoy! And a huge thanks to all who entered the giveaway! 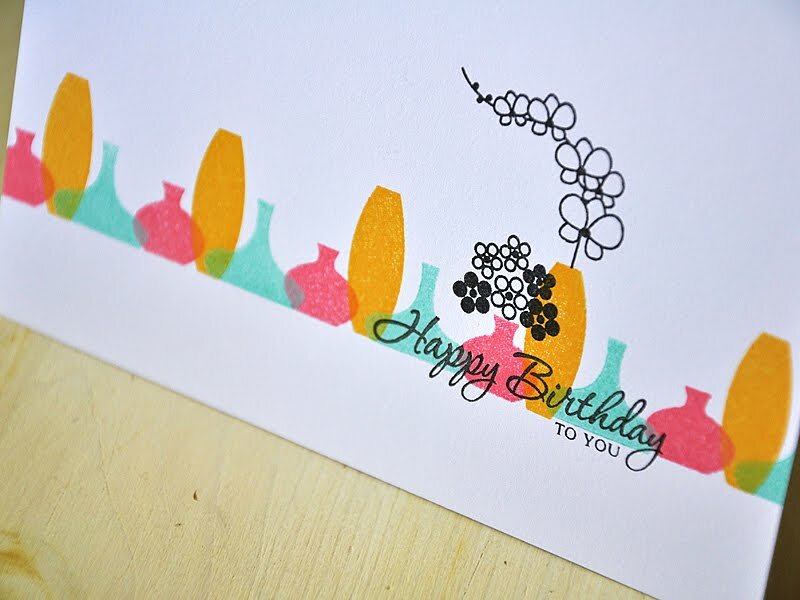 Since the Papertrey Ink June release is over, I've got a bunch of cards to share with you today. So let me get started!... 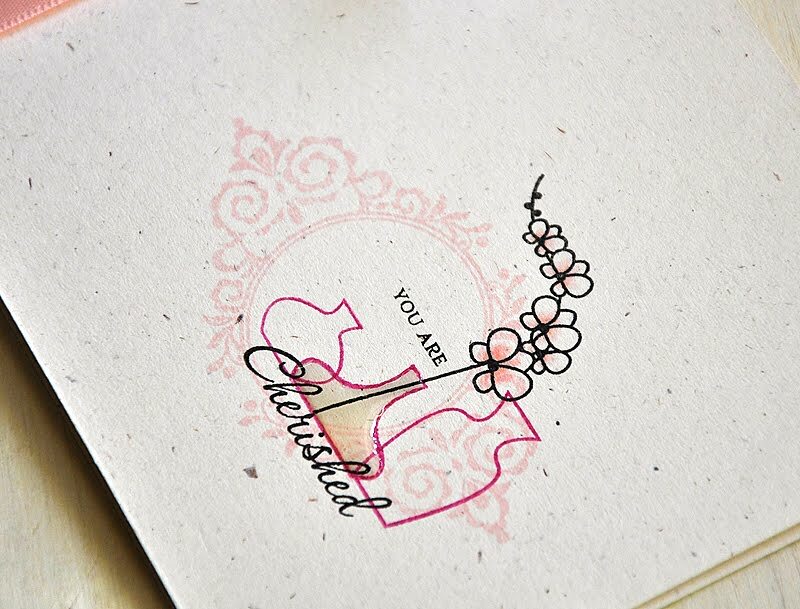 First up, a simple yet elegant card using Tag-its #5 by Heather Nichols (which happens to be my favorite of this series so far!). 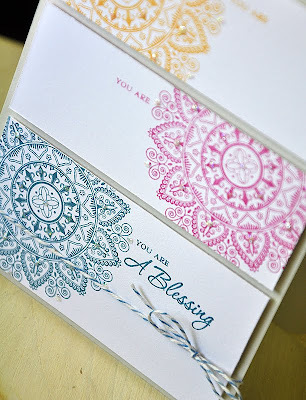 I stamped the doily circle in lavender moon, the flower bunch in Plum Pudding and a sentiment in True Black. Mounted the stamped circle onto a Mat Stack #5, which was impressed with the new Damask Design Impression Plate. 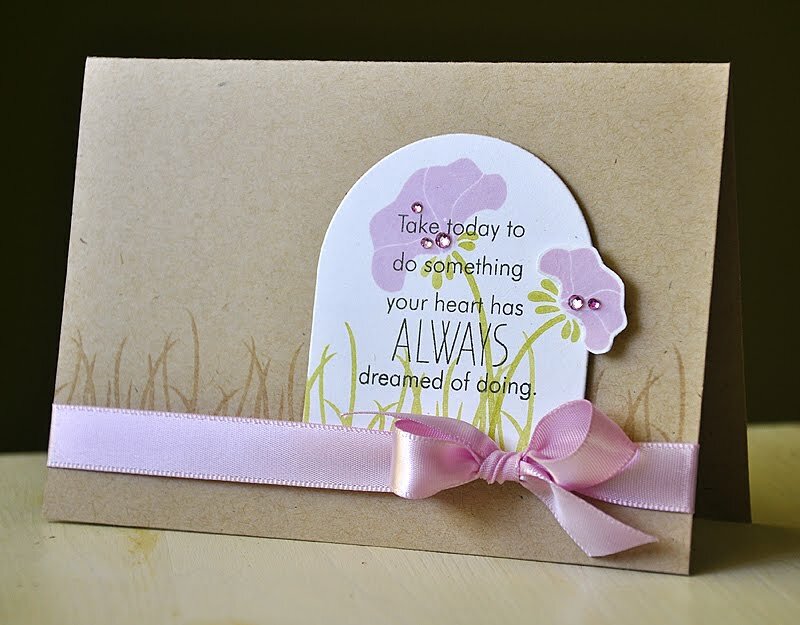 Next, a creation using Daydreamer by Nichole Heady. 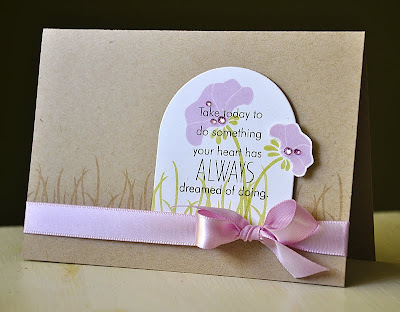 Started this card by stamping the grassy image, in Versamark, onto a kraft card base. 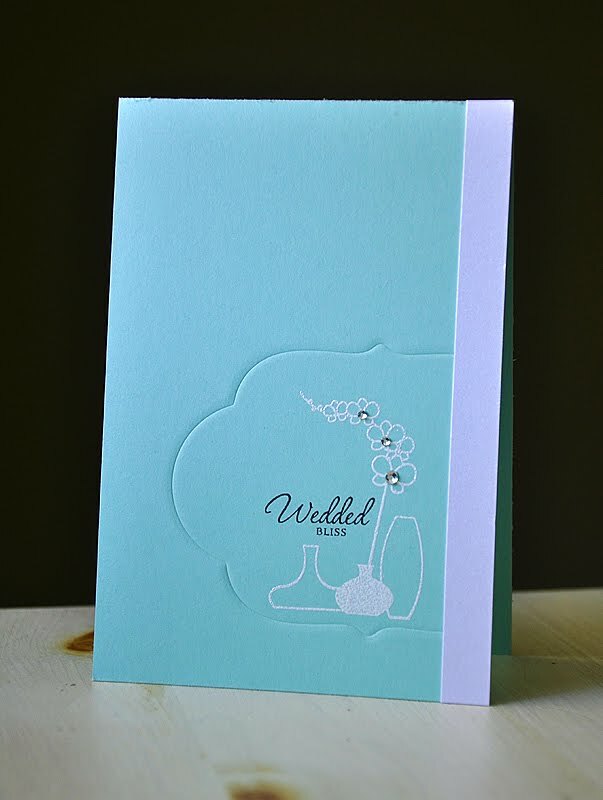 Created a focal image by stamping a the grassy image and two stems, in Spring Moss, onto a die cut Sending You frame. Stamped the flower tops in lavender moon, one directly onto the frame and the other I stamped, cut out and attach with dimensional adhesive. 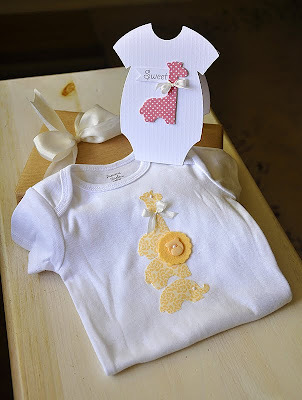 Then wrapped with ribbon and embellished with rhinestones. Then stamped the sentiment in True Black. Here's a card perfect for the party animal in your life, using It's A Jungle Out There by Dawn McVey. I impressed a Soft Stone card base with the Animal Prints Impression Plate. 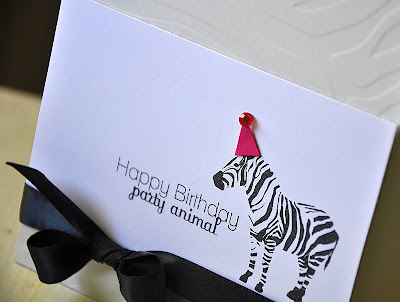 Stamped the zebra in True Black and topped him off with a Raspberry Fizz party hat. 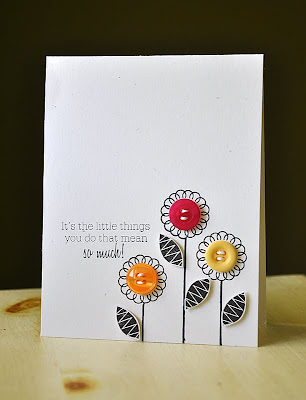 How about a little Flower Fusion #5, by Melissa Bickford, fun! I stamped the flower tops, in True Black, and then drew a few stems by hand with a black marker. Hand cut a few leaves and attached with dimensional adhesive. Finished the card of with a sentiment and a few colorful buttons in Orange Zest, Raspberry Fizz & Harvest Gold. 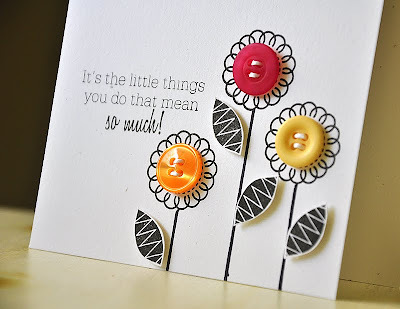 Here's a simple card using Lizzie Jones' new Rhythm & Soul set. I stamped the guitar images in Chai Vintage Touch ink and a sentiment (from Embellishments) in Hawaiian Shores ink onto Rustic Cream cardstock. Attached a strip of Basic Grey Sweet Threads pattern paper and embellished with a stitch button and wrapped twine. 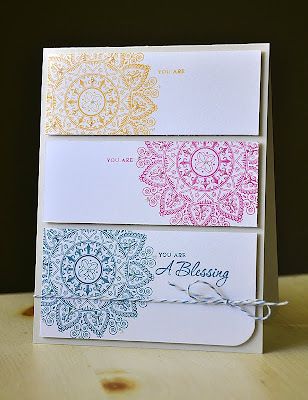 Last but not lease, another stunning set by Nichole Heady, Mehndi Medallion. 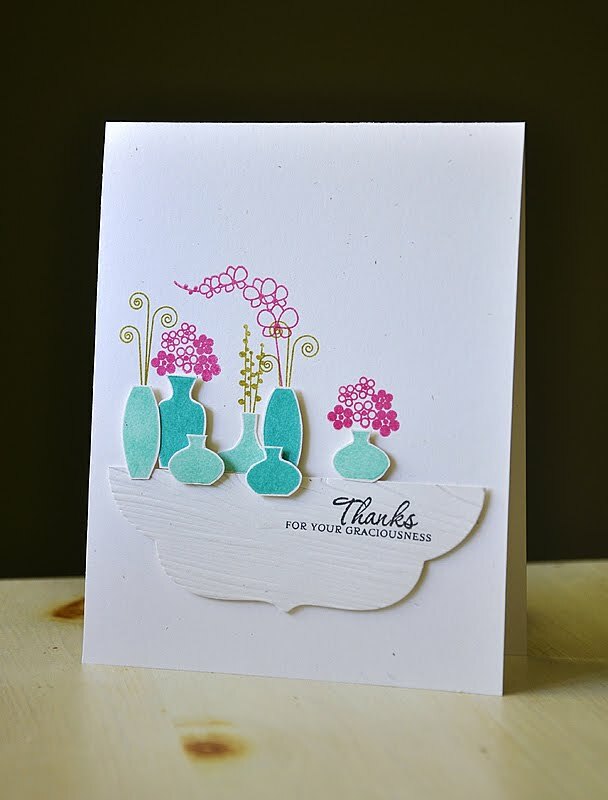 The sentiments are from Gracious Vases. 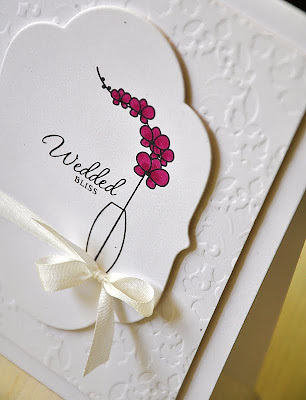 Stamped panels in Raspberry Fizz, Summer Sunrise & Enchanted Evening, onto white cardstock. Mounted the panels onto a Soft Stone card base and wrapped with Enchanted Evening Baker's Twine. 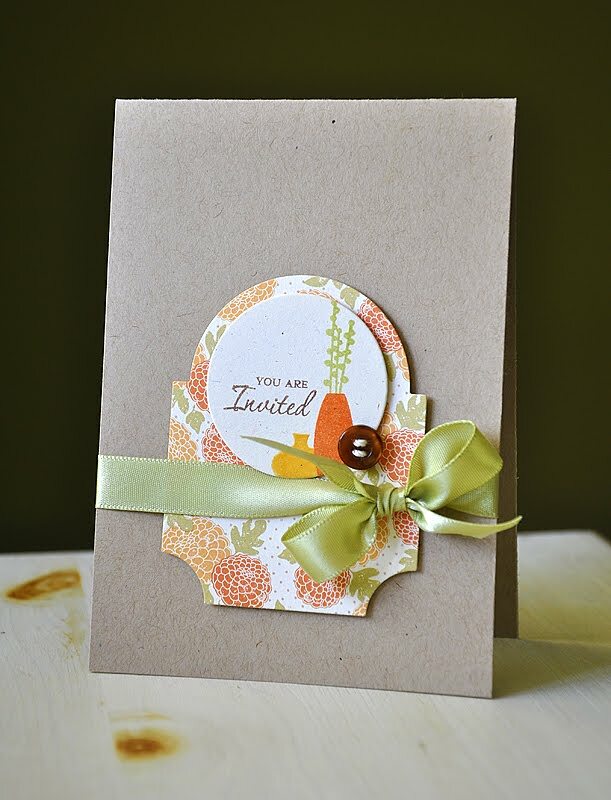 Get ready for a summer full of colorful cardmaking fun with Summer Card Camp 2011. Jennifer McGuire and Kristina Werner have teamed up to bring you a 4-week workshop loaded with fresh color combos, cutting edge techniques, and versatile sketches that will leave you feeling inspired to create! Summer Card Camp is your all-access pass to 48 new card ideas, daily PDFs, twice weekly videos, guest designers (including me! ), huge prizes and access to a private blog where you can share your own creations. For more information and to register, visit http://onlinecardclasses.com/summercardcamp2011/classinfo.html. Want to win a spot in this class?! I'll be giving away three spots, just leave me a comment on today post by Monday, June 20th, 11:59 (PST). Please note, if you are picked as a winner and have already signed up, you will be given a refund. I am extremely blessed to be amongst such a line up of talented ladies! And I don't know about you, but I can't be more excited about starting this class! I know this class will be a ton of fun and a huge success. I can not thank Jennifer and Kristina enough for this opportunity! Hello everyone! Keeping things simple today, for day five of the Papertrey Ink countdown. 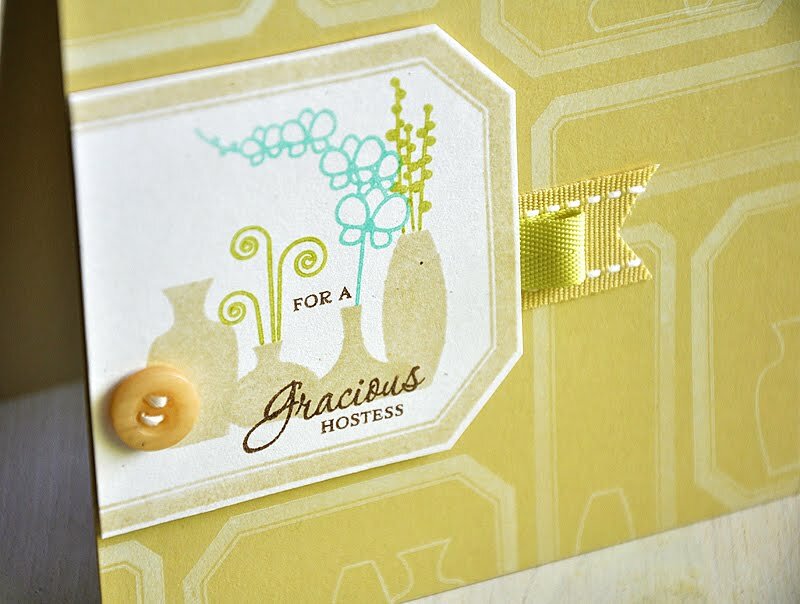 So, I've got a couple simply designed cards, using Gracious Vases, to share with you... First up, I paired Gracious Vases with the soon to be released Think Big Favorites #5. Started by stamping "Congrats" in True Black onto a Rustic White card base. 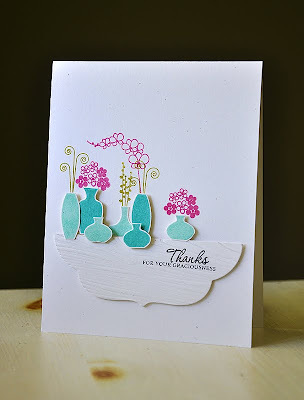 Stamped a few vases in Aqua Mist, Berry Sorbet & Summer Sunrise, and a filler in Ripe Avocado. I then selectivly inked a couple dotted strips, from one of the images included in the Mat Stack #1 Collection set, in True Black. 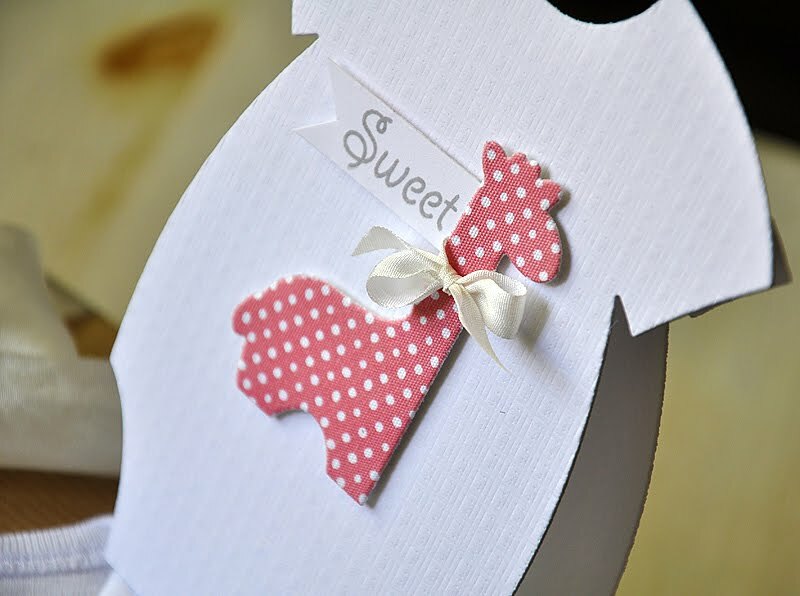 Finished the card off with a rounded corner. 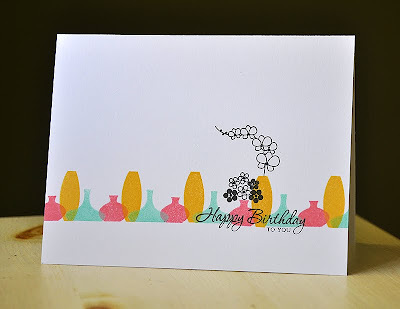 For this simple second card, I stamped a row of vases in the same colors as above onto a white card base. Then stamped a few embellishing images in True Black, a couple fillers and the sentiments "Happy Birthday" and "to you". And that was it, easy peasy! 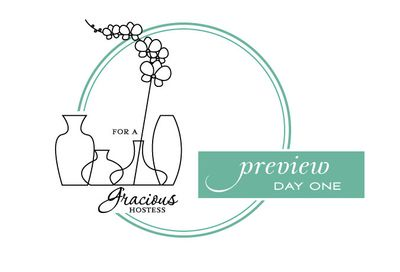 So who's ready to get their hands on Gracious Vases?! You don't have to wait very long, tomorrow is the big Papertrey Ink June release day and this little set will be ready to make it's way to your home! I hope I've inspired you through this entire countdown week and I thank you all for your supportive and encouraging comments! 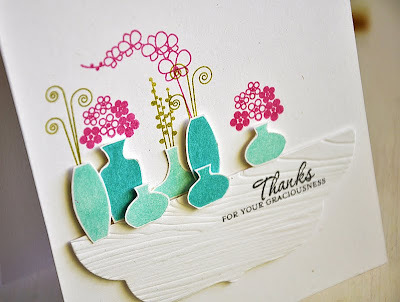 I hope to see your Gracious Vases creations soon! Now, be sure to visit Nichole Heady , Dawn McVey, Heather Nichols, Melissa Bickford, Alli Miles and Lizzie Jones for even more peeks at this month's new goodies. Thanks for stopping by, have a super one! 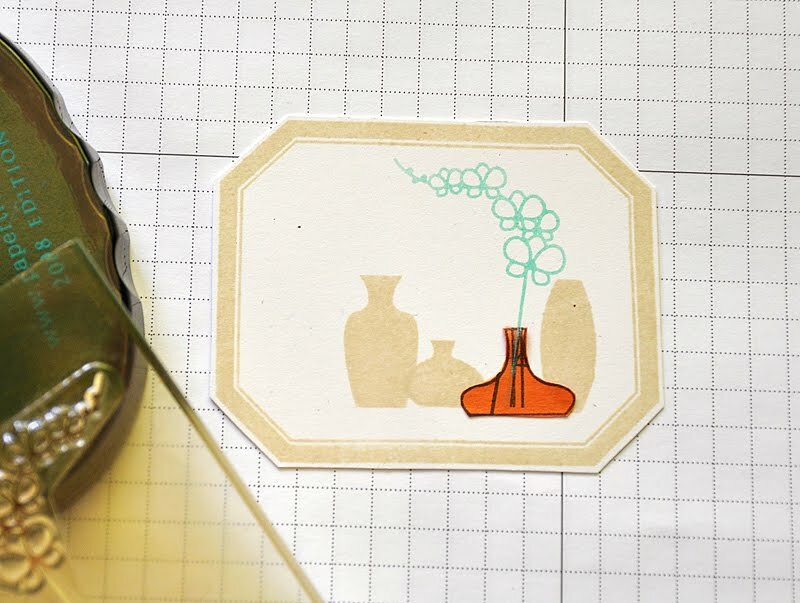 It's day four of the Papertrey Ink countdown and yet another day of Gracious Vases samples. Today I'd like to focus on a couple techniques that work very well with this set... First up, heat embossing. 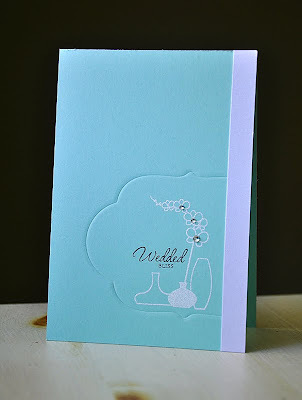 Started this card by stamping a small row of vases and an orchid in Fresh Snow ink onto an Aqua Mist card base. Then heat embossed these images in white. 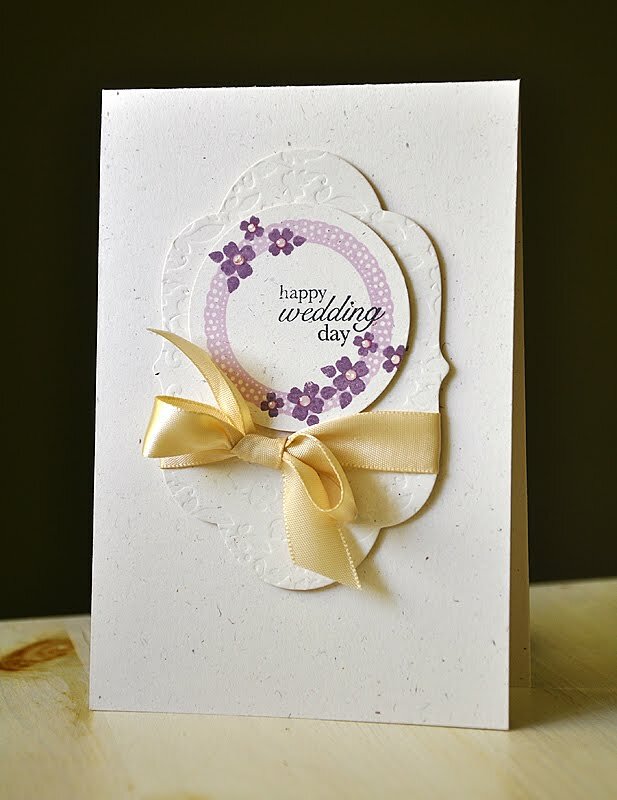 I then impressed a Mat Stack #5 shape around the embossed images, embellished with a few rhinestones and attached a White Shimmer cardstock strip along the right edge. Next, paper piecing. I pulled out the new Damask Design pattern paper pack (also available June 15th) and covered the card base with a sheet of green damask. Stamped the liner vases and fillers onto a die cut Mat Stack #1. 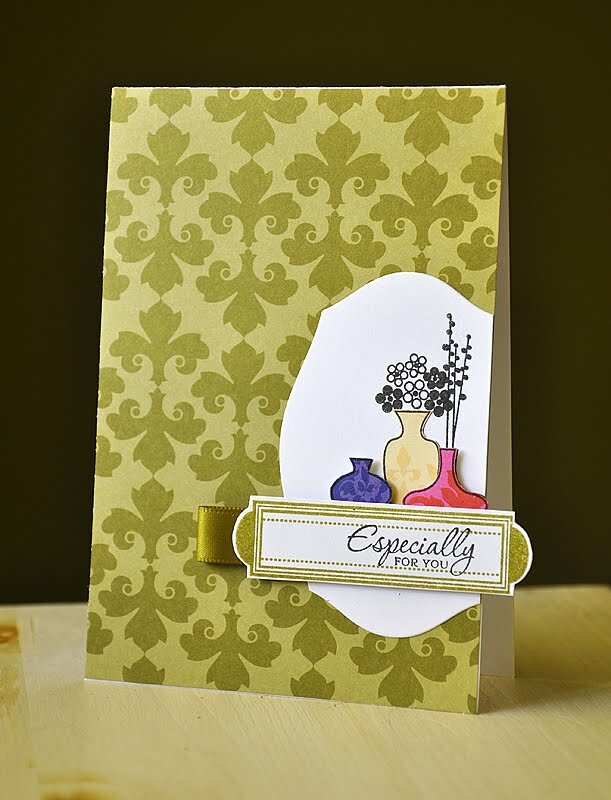 Stamped the liner vases again onto colored damask pattern paper, cut out and attached. This Mat Stack #4 Collection sentiment strip was stamped in Ripe avocado, then over that I stamped "Especially" and "for you" (both from Gracious Vases) in True Black. Cut the sentiment strip out and attached, with dimensional adhesive, just under the vases. That's all I've got for day four, but I do hope that you've enjoyed today's Gracious Vases cards. Remember, if your as excited about this set as I am, you'll have the opportunity to purchase this set beginning June 15th! Be sure to visit Nichole Heady , Dawn McVey, Heather Nichols, Melissa Bickford, Alli Miles and Lizzie Jones for even more peeks at this month's new goodies. Hello all! Today is the second group post day of the Papertrey Ink countdown. This time around the design teams focus is on a new set designed by Nichole Heady's, Happy Trails. This set is full of things that leave behind "trails". 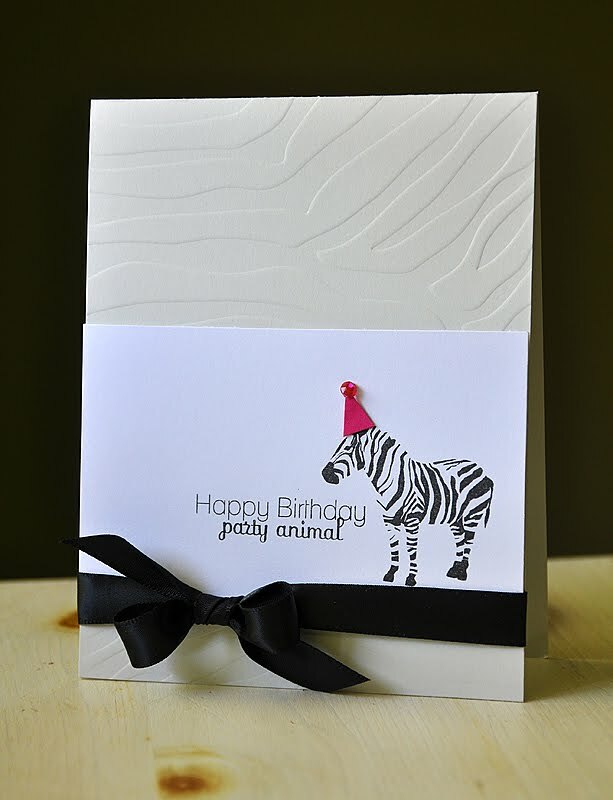 You'll need to visit every Papertrey Ink design team member today to find out what they are. For my project, I chose to work with the paper airplane... 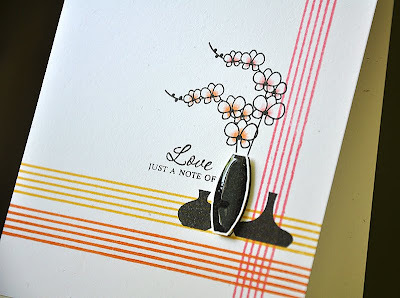 I started by stamping the sentiment onto a Soft Stone card base in True Black ink. Then stamped three airplane trails in Smoky Shadow ink and rounded the bottom corner. 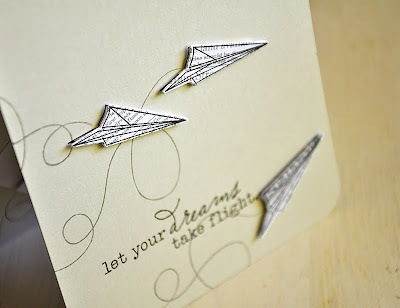 Using the coordinating Happy Trails die, I die cut three paper airplanes from white cardstock and stamped the paper airplane image in True Black ink. 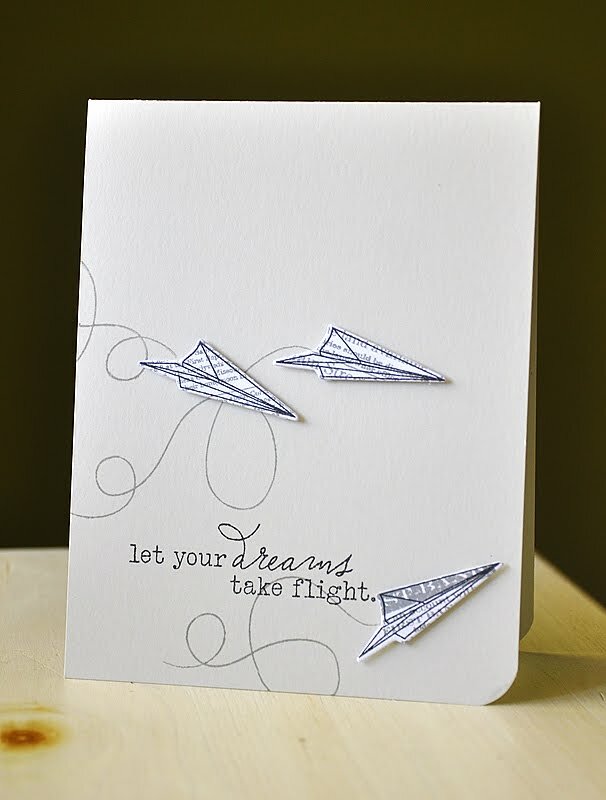 For a bit of added interest, I drew inspiration from the folded newspaper airplanes and hats of my childhood and pulled out my Background Basics: Newsprint set and stamped each paper airplane in Smoky Shadow ink. 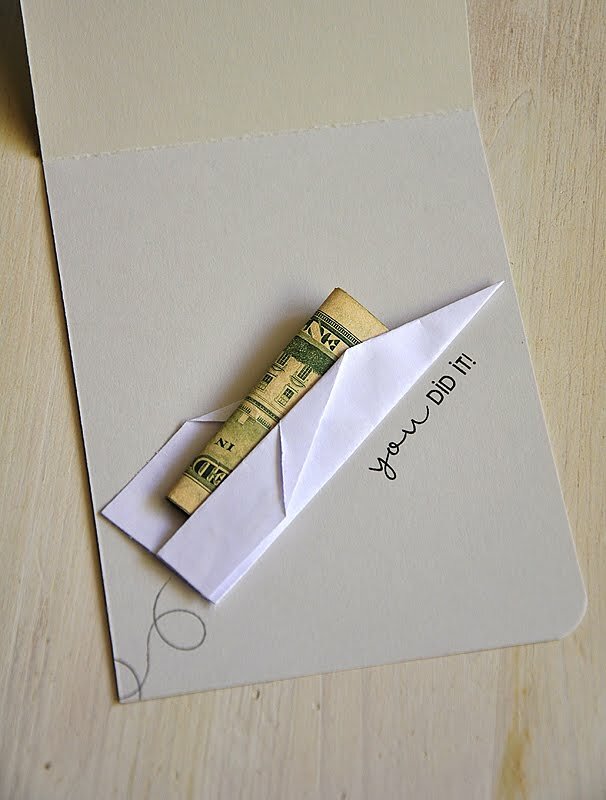 To continue this fun theme onto the inside of the card, I folded a small paper airplane from a 5 1/2" x 4 1/4" piece of computer paper. Attached it to the inside of the card, inserted a folded bill and sealed the edges closed to help keep it in place. 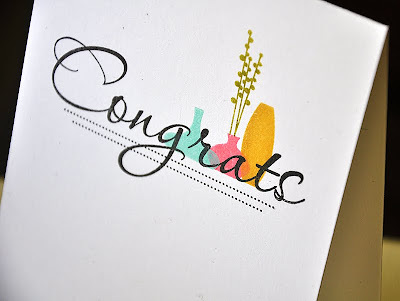 Stamped a trail in Smoky Shadow ink and a sentiment from Fillable Frames #3 in True Black ink. Hello, it's me again! 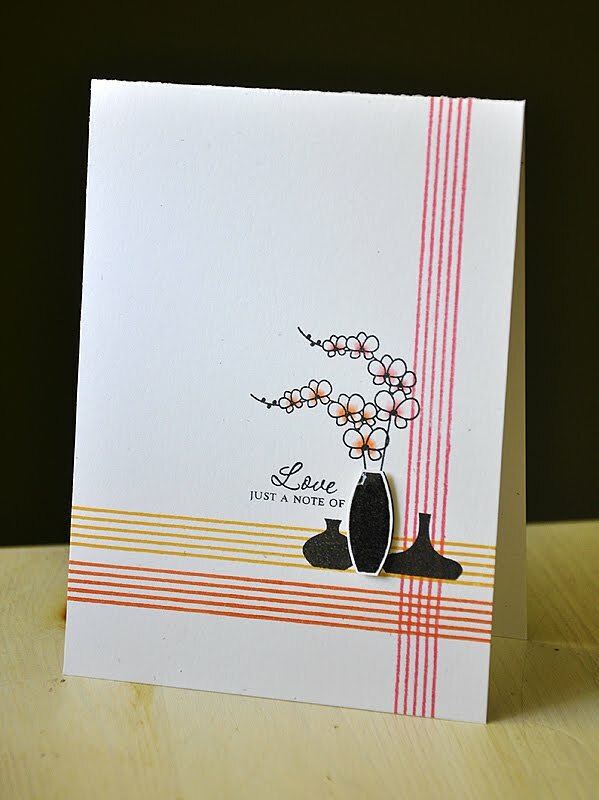 I'm back today for day three of the Papertrey Ink countdown and the third day of highlighting my newest set, Gracious Vases (which is available for purchase, at Papertrey Ink, beginning June 15th). I hope you're enjoying the samples thus far! First up, how about a bit of an Asian influenced design?! Using the liner image from Backgrond Basics: Retro, I stamped three srips to create a focal point in the bottom corner of a Rustic White card base. Stamped them in Berry Sorbet, Summer Sunrise and Orange Zest. Directly over the lines I stamped three vases, two orchids, and the sentiment in True Black. For perfect alignment of the sentiment I stamped "just a note of" first and then "love" on top, to create the phrase "just a note of love". 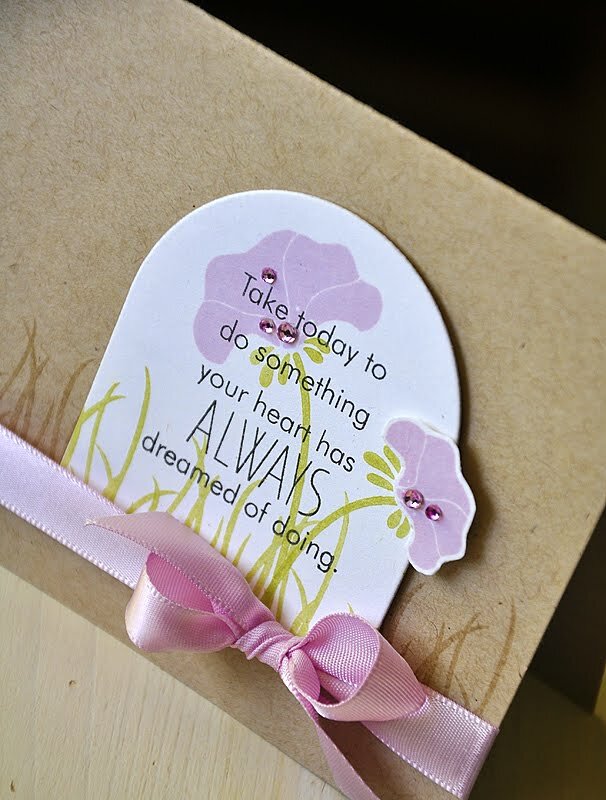 I could see myself using this sentiment/card as a note to my hubby or just to let someone dear to me know that I care or that I'm thinking of them. This close up shot gives you a good idea of what I was talking about earlier, that shine from the Ranger Glossy Accents makes me want to reach out and touch it, to see if it's real. It's just a neat effect. To finished the card off, I touched up the center of each flower with a bit of Copic marker coloring. Next up, a more softer look. One of my favorite ways to create a single layer card is to layer stamped images and create a unique and interesting focal image. 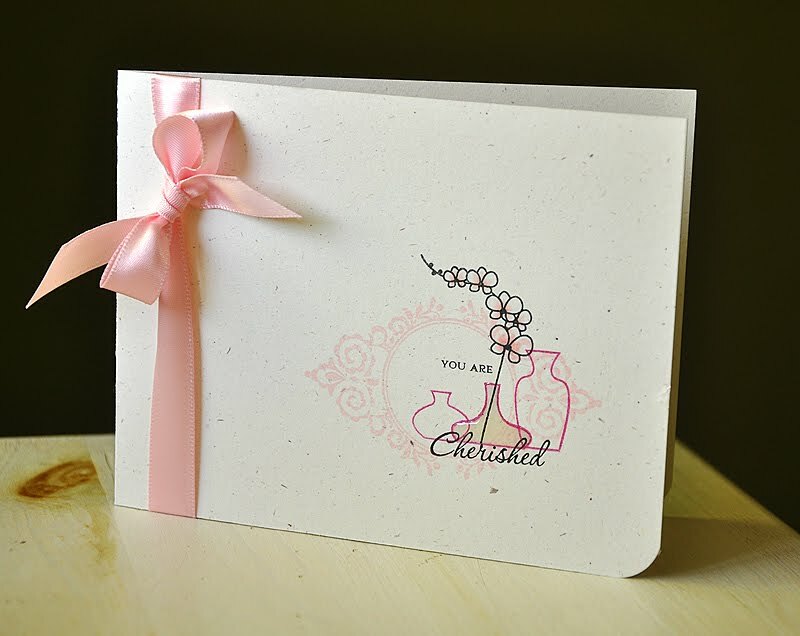 Onto a Rustic Cream card base I started by stamping a scrolly frame, from the Mat Stack #2 Collection, in Sweet Blush. Then stamped three liner vases in Raspberry Fizz. Lastly, in true black, I stamped the sentiment and orchid. Added a touch of Glossy Accents to a single vase and Copic marker to the orchid flowers. Well, that's it from me today! I hope you've enjoyed and I hope you'll let me know what you think! I'll be back tomorrow with more Gracious Vases. See you then! Be sure to visit Nichole Heady , Dawn McVey, Heather Nichols, Melissa Bickford, Alli Miles and Lizzie Jones' for even more peeks at this months new goodies. Today is the day! The first group post of the Papertrey Ink countdown! Group posts are always fun, I love to see the various takes that the entire Design Team comes up with when using the same products. 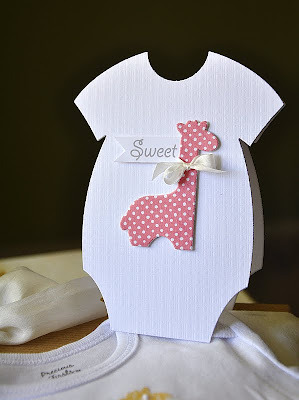 Today we, the Design Team, get to bring you some fun and adorable baby projects, using this months baby line up of stamps and coordinating dies (which are all available beginning June 15 at Papertrey Ink). I've chosen to focus on Sweet Baby, it's coordinating Sweet Baby Die and the Shape Up Series: Onesie Die to create this adorable onesie ensemble. 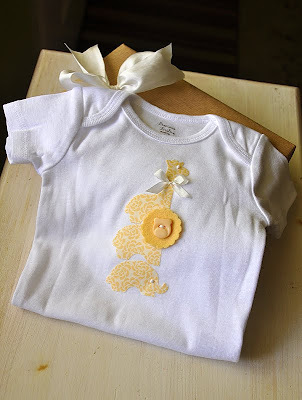 For this 'one-of-a-kind' onesie, I couldn't help but stack these adorable Sweet Baby die cut animals. I die cut them from some fabric I've had hanging around for a while now. Here's A Tip: When die cutting fabric, I found it best to create a tight fitting die cut sandwich. I stacked an extra sheet of cardstock behind the fabric, this allows the die edges to cut entirely through the fabric it's self, right through and into the extra piece of cardstock. To attach these die cut cuties to the onesie I chose to work with some No-Sew Iron On Fabric Adhesive. Here's A Tip: This fabric adhesive can easily be die cut through, I cut mine at the same time I die cut the fabric. 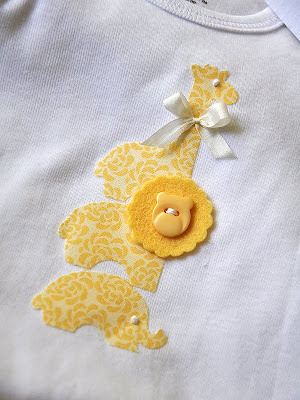 Once the animals were ironed into place I embellished with a Harvest Gold loin mane, Harvest gold button (how perfect is this shaped button?! ), French knots (tutorial here) for eyes and a silk bow glued into place. To complete this ensemble, how about a matching onesie card?! 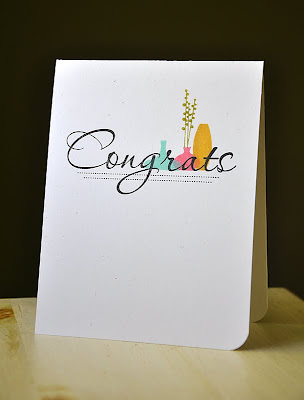 I started by die cutting the card from white cardstock. Then, to give it a bit more of a realistic look, impressed the front with my Linen & Canvas Impression Plate. This adorable giraffe was die cut from a sheet of polka dot American Crafts adhesive backed fabric paper. Tied a bow around it's neck and attached with dimensional adhesive. Then, to finish it off, I stamped, cut and attached a sentiment strip. 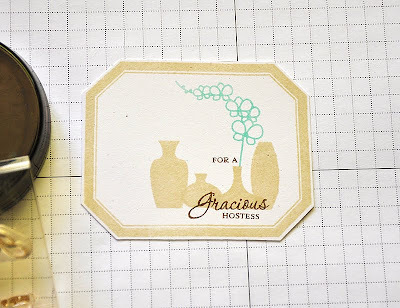 It's day two of the Papertrey Ink countdown and the second day of sharing my latest Stamping Simply stamp set, Gracious Vases, with you (which will be available for purchase at Papertrey Ink beginning on June 15th)! 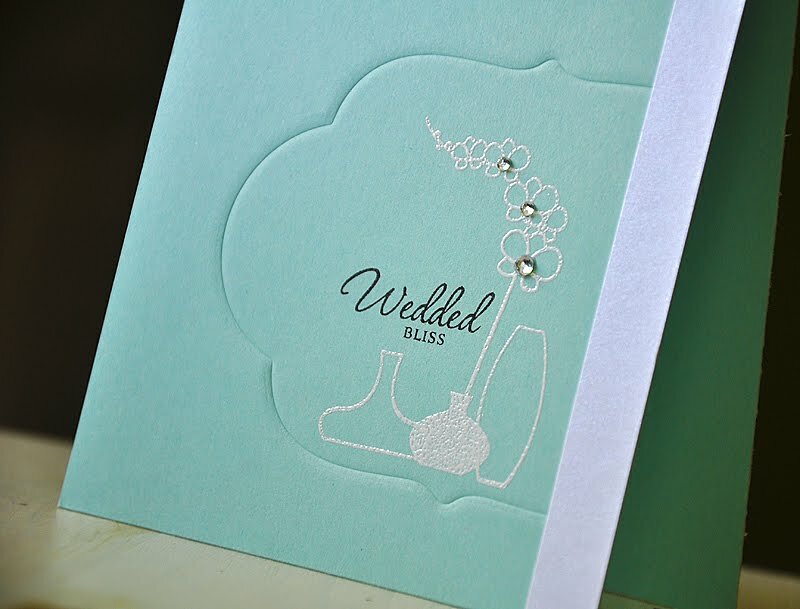 First up, a simple yet elegant wedding card with a pop of color. 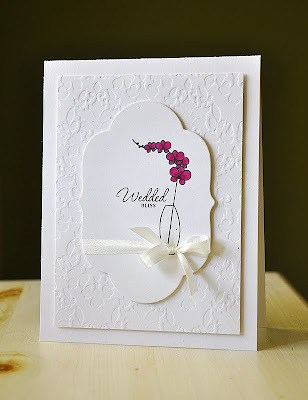 I started by impressing a block of Rustic White cardstock with the one of the new and gorgeous Impression Plates, included in this months release, Damask Designs. I then attached the impressed cardstock block to a Rustic White card base with dimensional adhesive. Die cut a Mat Stack #5 from Rustic White cardstock and stamped it with a vase and the orchid (my favorite image from this set), in Palette Noir. Then colored the orchid blossoms with a couple of Copic markers. Stamped "Wedded Bliss" (which is a single sentiment stamp) in True Black and wrapped the mat with white silk ribbon and attached to the card base with dimensional adhesive. Next up, a hostess thank you. I had a ton of fun creating this card, especially this hand stamped background. Using Label Basics, I took almost all the angled rectangular labels and randomly stamped them onto a Fine Linen card base in Fresh Snow ink. Within the labels, I randomly stamped the liner vase images from Gracious Vases also in Fresh Snow. Love the way this turned out! 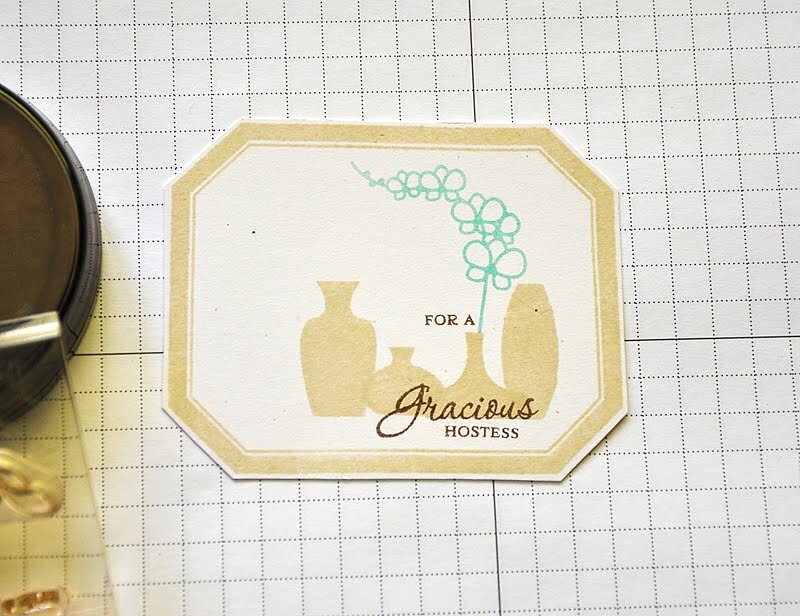 To create the focal point, I started by stamping the large angled rectangular label in Chia Vintage Touch ink and then cut it out by hand. To ensure proper alignment of the stamped vases, I drew a light pencil line for me to follow. This is not a necessary step, but some of you may find it helpful. 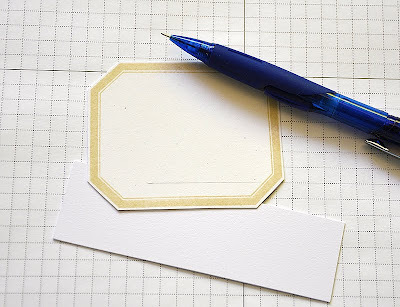 Also, a cardstock strip makes the perfect straight edge! Next, I stamped the four solid vases along the pencil line, also in Chia Vintage Touch ink, and then erased the line. Placed a mask over one of the vases and stamped the orchid in Aqua Mist. Removed the mask and stamped the sentiment. 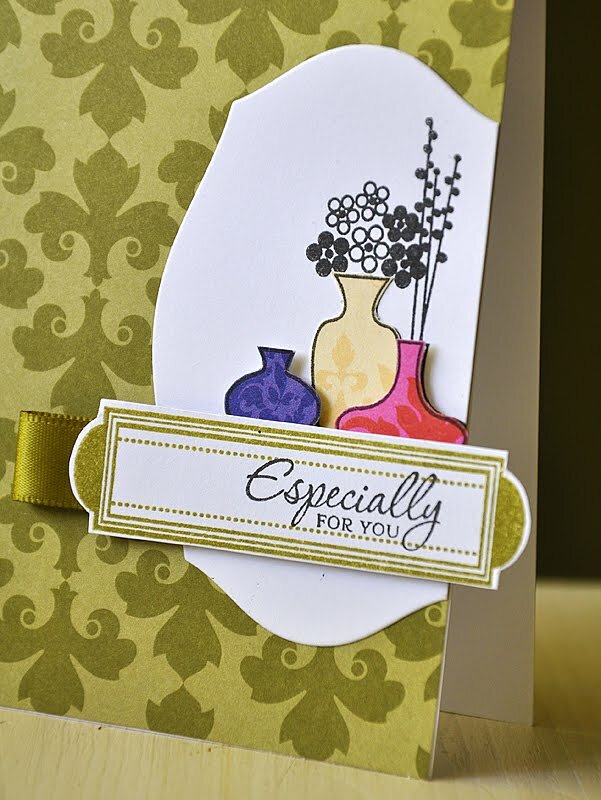 This sentiment was perfectly placed and stamped (in Dark Chocolate) using three separate sentiment stamps included in Gracious Vases. I love how this allowed me to not only create the perfect sentiment, but also to create a visual flow across the vases. Finally, I masked off a couple more vases and then stamped with fillers, in Spring Moss. Attached the label to the card base with dimensional adhesive and trimmed off the edge. Finished the card off with a couple ribbon tabs and a Fine Linen button. 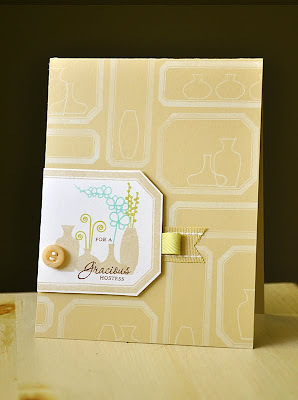 That's it from me today, but I'd love to know what you think of Gracious Vases so far! Don't miss the rest of the the happenings for today. Dawn McVey, Heather Nichols, Melissa Bickford, Alli Miles & Lizzie Jones are showcasing their own new sets. Nichole Heady & Erin Lincoln have even more new goodies to share with you too. Thanks for stopping by. Have a super one! Welcome to the first day of the Papertrey Ink June countdown! I am super excited to share with you the next stamp set in my Stamping Simply line up... Gracious Vases! Which is available for purchase at Papertrey Ink starting June 15th. Gracious Vases is a $15 set that includes a number of modern vases and perfectly sized fillers, which allows you to have fun mixing and matching to create the perfect center piece for your creations. The sentiments are broken down, which makes for perfect placement and includes even more mixing and matching possibilities. And I am so in love with the font selection of this set! Now how about a couple samples!... First up, a simple invitation. 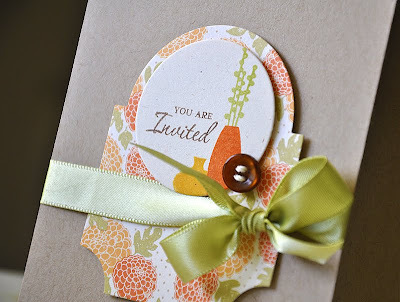 I die cut a Mat Stack #3 from some Autumn Abundance pattern paper and attached it to a kraft card base with dimensional adhesive. Then wrapped the card base with some Spring Moss satin ribbon. 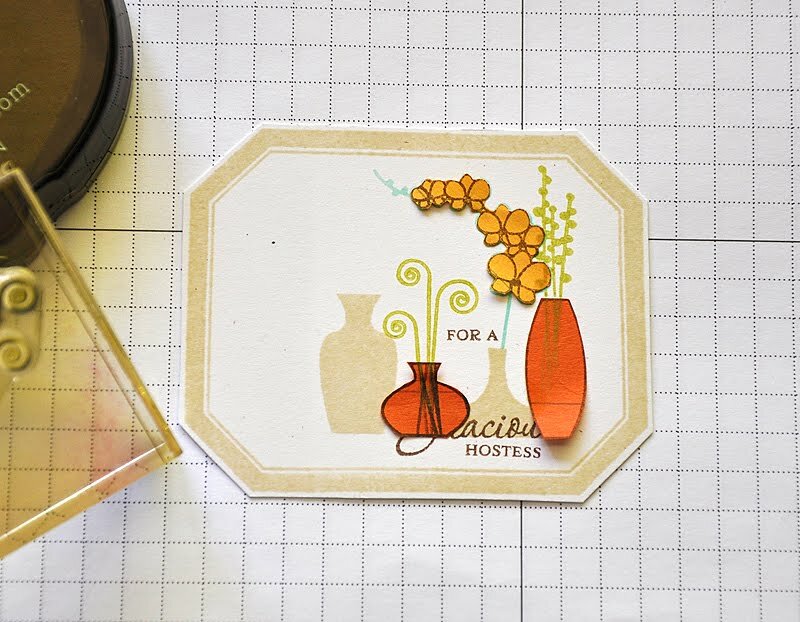 To create a simple focal point, I started by stamping a die cut circle with the larger vase in Orange Zest. Placed a mask over the larger vase and then stamped the smaller vase in Summer Sunrise and the filler in Spring Moss. 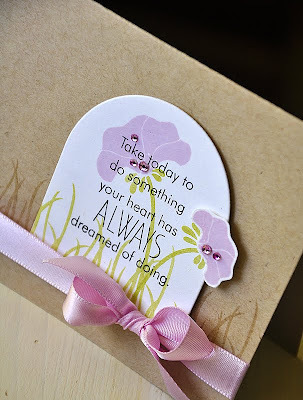 I then stamped the sentiment in Dark Chocolate and attached the circle to the card base. This sentiment is actually two separate pieces, "you are" and "invited". 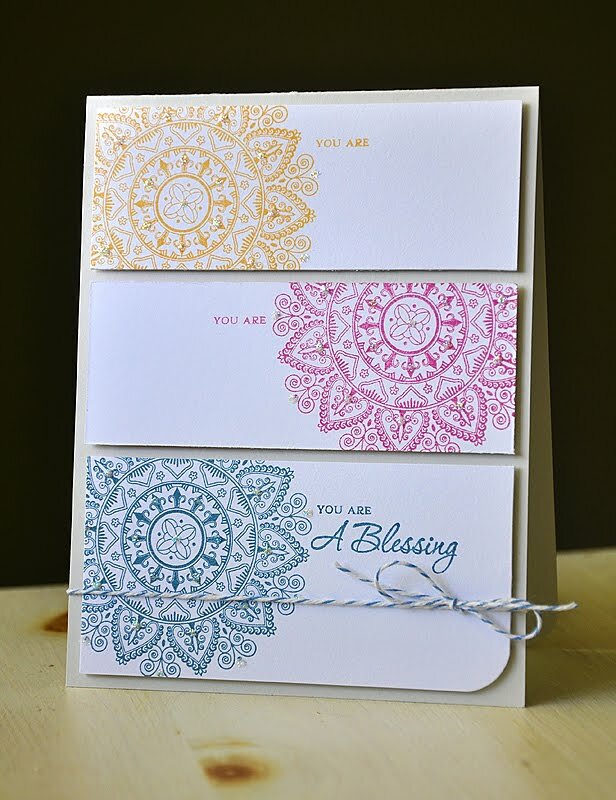 So, if I had chose to, I could have easily inked and stamped both in different colors. Next up, a thank you card. A sentiment like this is perfect for a number of reason, possibly even for that hostess who invited you to the party you recently attended. For this card I was going for the look of a decorative vase arrangement on top of a table or counter of some sort. I started by die cutting a Mat Stack #5 from Rustic Cream cardstock, trimmed it in half & impressed it using the Woodgrain Impression Plate. 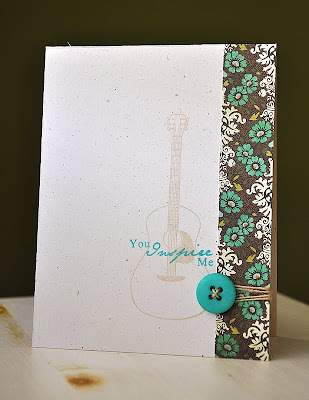 I stamped the impressed mat with the sentiment (again, this sentiment was created using two of the sentiment stamps included in the set) and then attached it to a Rustic Cream card base with dimensional adhesive. I then stamped and hand cut these Hawaiian Shores and Aqua Mist vases. Played around with the arrangement, but did not attach them to the card base yet. 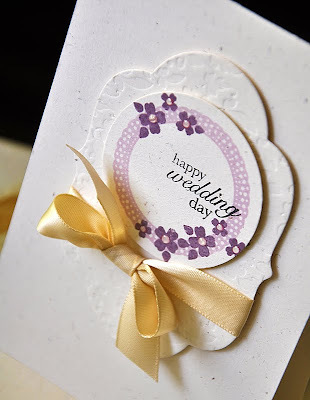 Once the arrangement was figured out, I stamped the fillers directly onto the card base, being careful to stamp each in it's proper place. Then I was able to attach the vases onto the card base at varying heights. Well, that concluded my first look at Gracious Vases. I truly hope that you enjoyed! Be sure to visit Nichole Heady and Besty Veldman for even more Gracious Vases inspiration. Also, Dawn McVey, Heather Nichols, Melissa Bickford & Alli Miles have peek to share with you of their newest sets for the month. And last but not least Jessica Witty has some of Lizzie Jones' Rhythm & Soul goodness to share too. 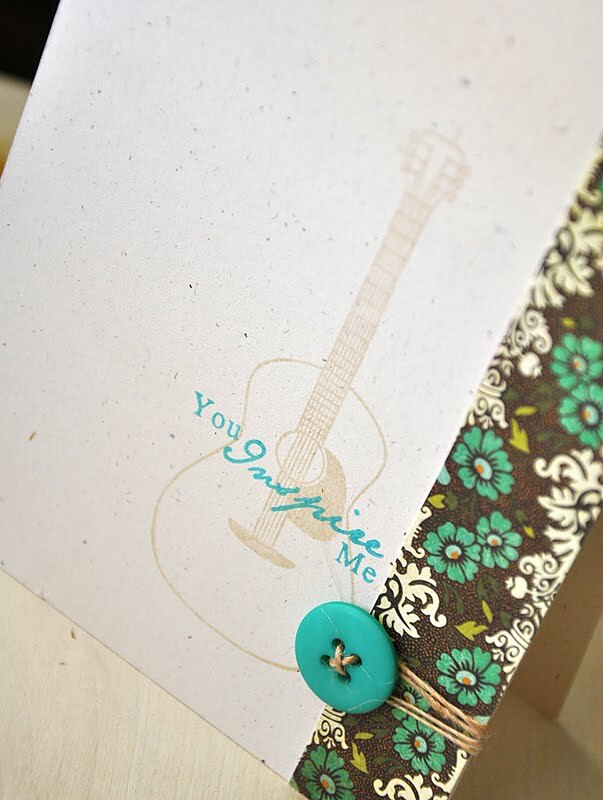 The Papertrey Ink June 15th release is quickly approaching and today is Sneak Peek Day #1! 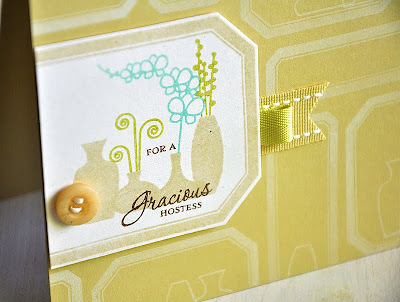 Here's a peek at my latest set, Gracious Vases... It's a fun set that features a variety of modern vases and perfectly sized fillers, with mix and match possibilities galore! I hope you'll stop by my blog for the countdown, starting June 10th! See you then!